Explore the highlights of Istanbul, where Turkey’s Ottoman and Byzantine empires located before. Visit the fascinating Dolmabahce Palace, breathe taking Çamlıca, Ortaköy, a historical Rüstem Pasha Rescue and famous Spice Bazaar with an expert guide. Learn all history about extravagant sultans and discover Ottoman and Byzantine era architecture. You will be taken in the morning and cruise along the Bosphorus Strait by boat. Also, you will visit Spice Bazaar, the last residence of Ottoman Empire’s, Dolmabahce Palace and Rustem Pasha Mosque. We will also cross the Bosphorus Bridge and have the lunch at Camlica Hill to see the two sides of Istanbul better. After the tour, we will take you back to your hotel around 17:00 o’clock. Bosphorus Strait connects the Black Sea with the Sea of Marmara and splits the European and Asian sides of Turkey. 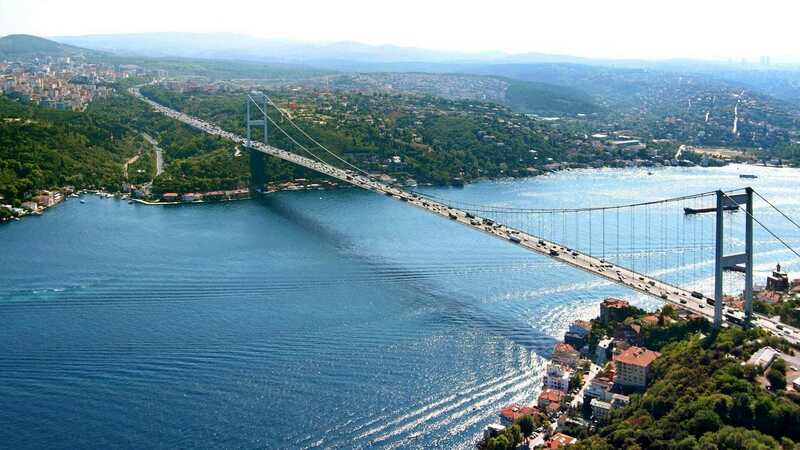 Bosphorus Bridge, pass through the bridge and watch the beautiful view. It is 1704m long and was the 4th longest bridge around the world. Don’t miss this unique chance to pass from one continent (Europe) to another (Asia) in 2 minutes. Camlica Hill, the highest point in Istanbul, exposing a panoramic view of Istanbul city and Bosphorus. Give a little break for lunch here and enjoy the view while you are eating your tasty meal. Ortakoy, is a cosmopolitan area, bordering waters of the Bosphorus. Turks, Greeks, Armenians and Jews are leaving here. The neighbourhood hosts many different religious. It is also a popular spot for locals with art galleries, night clubs, and restaurants. Eat your lunch at top of the Camlica Hill.